MAIA Impact School (formerly Starfish One-by-One), the implementing partner in Guatemala for the Rotary Club of Evergreen's Global Grant, was recently awarded the very prestigious Zayed Sustainability Prize for its work empowering women by providing schooling for Mayan girls and developing a sustainable farming learning environment. The prize is given to only six high schools in the world that can demonstrate impact, innovation, and inspiration to enable inclusive and equitable access to quality education. The MAIA Impact School represented an area that included all of North and South America. 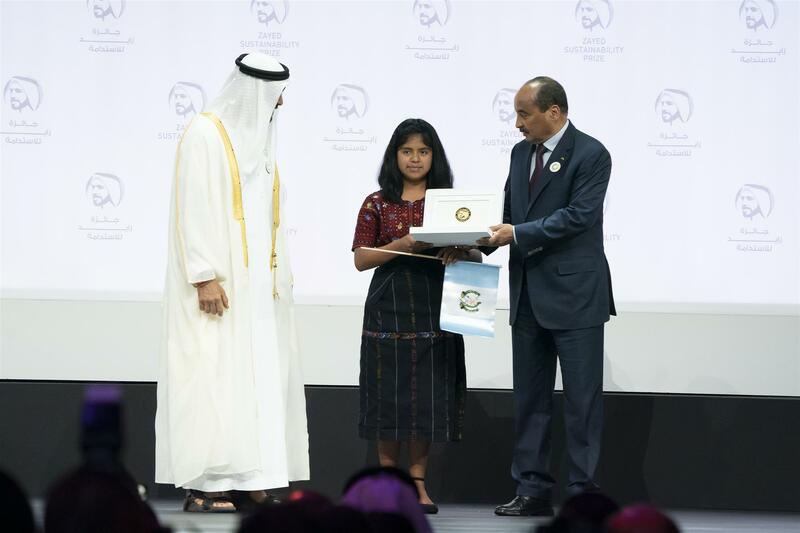 The award ceremony was held in Abu Dhabi, UAE, and was a central feature of the Abu Dhabi Sustainability Week (ADSW), one of the world’s largest sustainability gatherings. “ADSW brings together government, industry, and business leaders from across the world who share a commitment to accelerating the sustainability transition.” The Zayed Jury (and Selection Committee) received 2,100 applications from 130 countries and selected 10 winners across the categories of health, food, energy, water, and global high schools. The award, which carries with it a $100,000 prize, was introduced by Dr. Sultan Al Jaber, the Minister of State of the UAE, who shared this message with the audience, “Let us seize this opportunity to work together, share our knowledge and build on best practices. If we have the vision and the will and the commitment to act in partnership for a sustainable future, the possibilities of progress are just limitless.” MAIA school directors, Vilma Saloj and Lidia Oxi, traveled to the United Arab Emirates with Ester Bocel, a 9th-grader at the Impact School to attend the ceremony and receive the award from His Highness Sheikh Mohammed bin Zayed Al Nahyan, Crown Prince of Abu Dhabi (photo). Sustainability is one of the elements of success in each of the Rotary Foundation's areas of focus for global grants. This prize to our partner, MAIA, serves to validate our choice of an implementing partner. In his message to Rotary, MAIA CEO, Travis Ning, commented "Each of you has supported the school via Rotary as well as through your own personal efforts. We would love for you to be able to share back to your clubs the impact of the Global Grant that you are currently helping to steward. Please pass along this congratulation to your members as well as MAIA's deep gratitude for their support of this effort." For more information about the Zayed Sustainability Prize, please visit https://zayedsustainabilityprize.com/en.